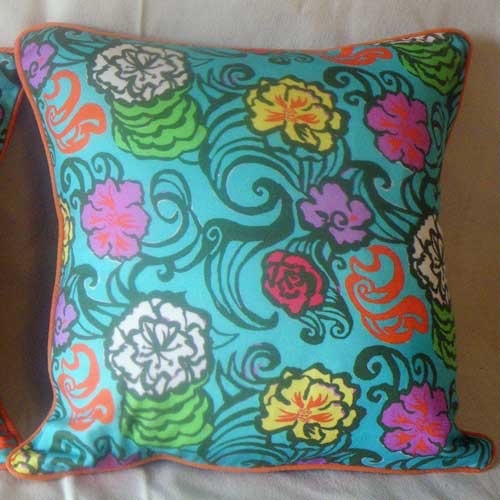 These Joie de Vivre creations for Interiors and for Fashion are unique designs all made with 100% cotton fabrics. Washing instructions: Wash in lukewarm water. Quilts should be dry cleaned. This funky design will add a ‘smile’ to any youngster’s bedroom! 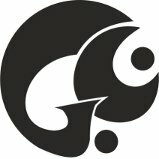 The printed fabric and plain fabric are 100% cotton. 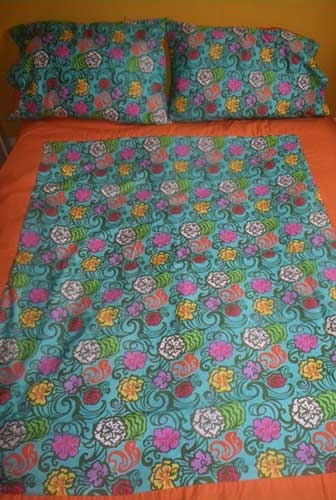 Pastel Blue pillow cases are available at extra cost if required. Sumptuous large quilt made with Hawaiian Flowers pattern in heavy satin cotton fabric with Tangerine orange border and backing. 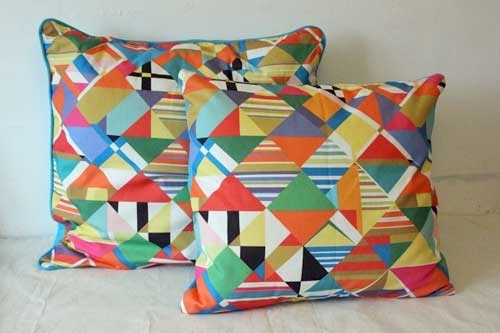 Matching pillow cases are available at extra cost if required. 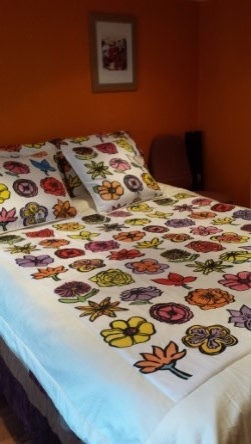 The large 'Botanical Flowers' quilt is a bold and colourful addition to any bedroom. 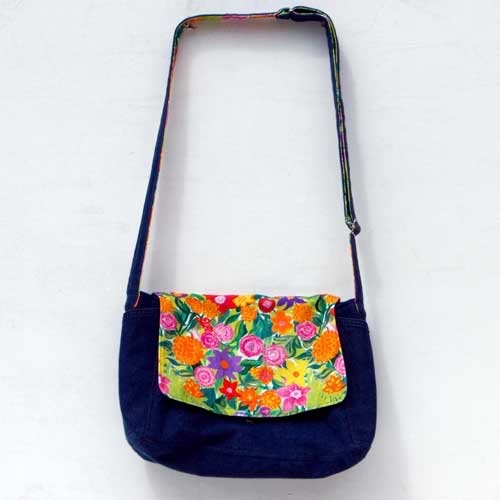 The Flower design is bordered and backed with a prussian blue cotton fabric. King size Quilt set plus two pillow cases and two cushion covers. 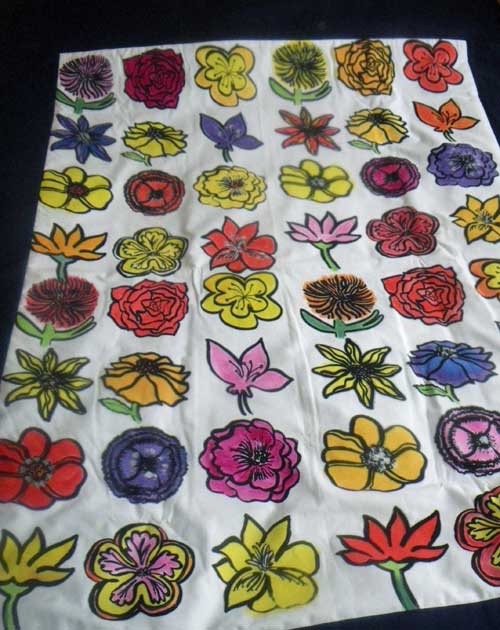 Hand printed 'Botanical Flowers quilt, with cream egyptian satin cotton border [other border colours are possible]. The quilt size is 74 square inches. 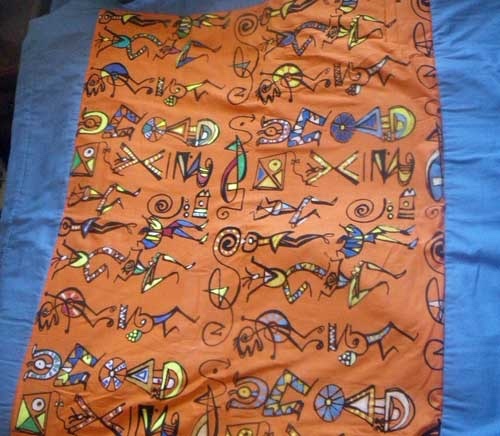 This quilt has a unique hand painted fabric on its front. 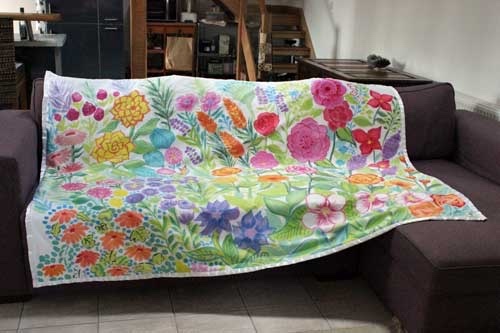 It makes an ideal sofa throw or bed throw. 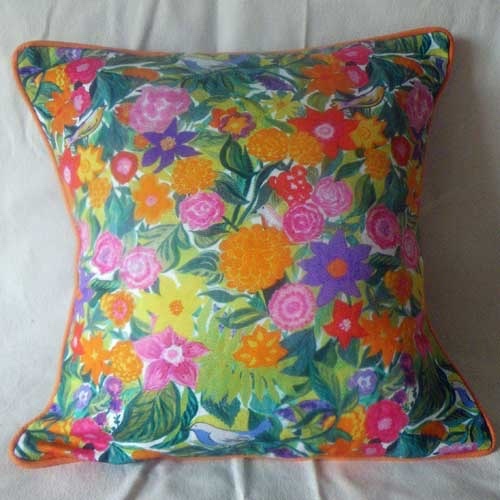 This colourful 'Hawaiian Flowers' cushion cover has orange piping and orange backing cotton fabric. 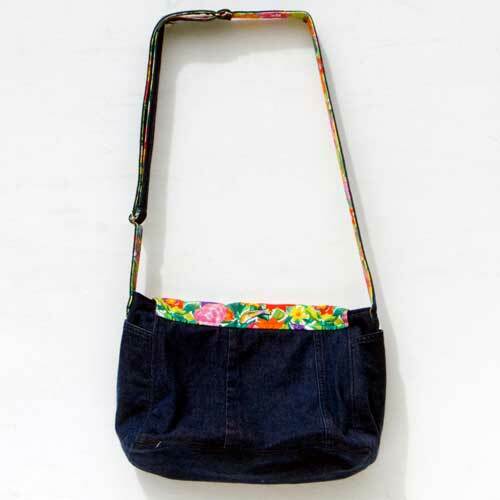 Our Joie de Vivre handbags use Joie De Vivre fabric combined with denim and includes a jean pocket whenever possible. 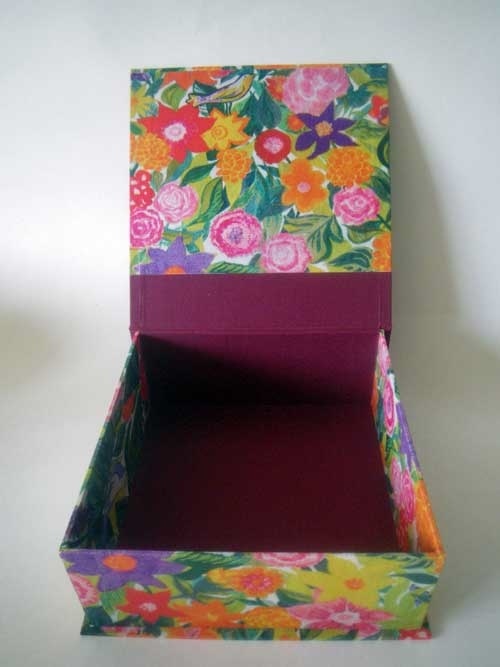 This Handcrafted box is decorated with Joie De Vivre paper and pale crimson linen fabric and a special hardboard. It makes a great storage box for paper napkins or whatever people want to put in a safe place. 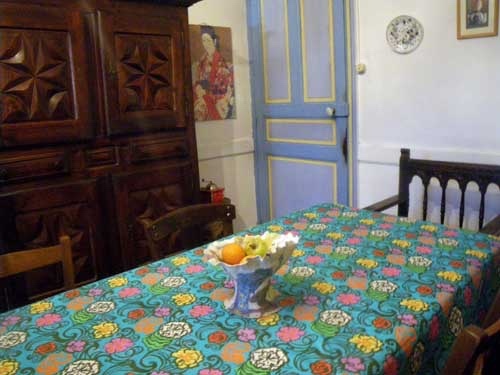 The Abstract Geometric design is printed on cotton hopsack 100% cotton and is backed here with a vibrant turquoise fabric.